Spiral Wound Gasket is the ideal gasket in the semi metallic gasket category. A norrow strip of V-shape metal hoop is spirally wound under tension with a filler cushion between the lamination of the metal and is spot-welded at both ends. This unique construction of a spring-like metal and soft filler provides gasket excellent characteristic. Great recilience which allows the gasket to adjust automatically to changes in operationg conditions, such and pressure and thermal shocks, vibrations, etc. Solid metal gaskets are often used on pipe flanges, pressure vessels, valve bonnets handling high pressure steam, gas, hot oil, oil gas, solvent vapor where high temperatures and high pressures. These gasket are made by various material steel materials. With thin metal plate and corrugation surface, these gaskets provide a seal at low seating stress. They also may be surface-treated flexible graphite. These gaskets are composed of carefully selected cushion materials with Non-Asbestos Millboard, Graphite Sheet and PTFE with external metal jacket of carbon steel, stainless steel, copper, 5Cr-0.5Mo alloy steel, etc. They are widely used on piping flanges, joints of machinery and mostly at the head of heat exchangers because they can be fabricated not only to a regular round shape but also to other irregular shapes such as oval, rectangular, etc. With additional rib or rib to seal multi-pass heat exchangers. 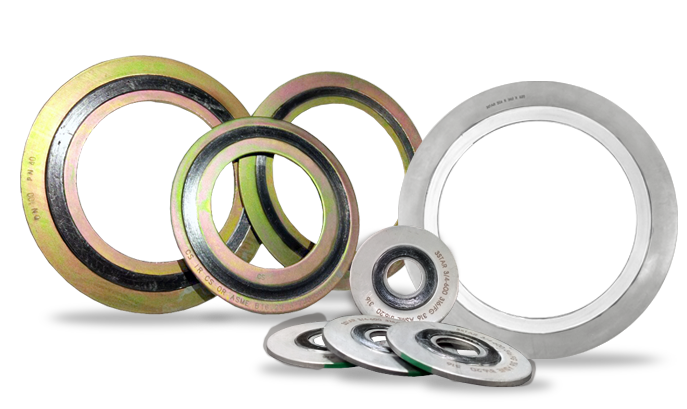 An increased demand has recently been seen for a special type having attached expanded graphite tapes on both sealing faces to increase seal ability.